Divination is the process of gaining information about the past, present, or future using certain object and tools which may include but are not limited to Tarot Cards, Runes, Astrology, Playing Cards, and the use of Crystal Balls---these being the most popular modes of divination today. The practice of divination has existed throughout history and permeates every culture. It has been used to foretell the future, find hidden treasure, discover the guilty, and lead one to love. The responsibility for divination has often fell upon the Priest, Shaman, Oracle, Witch, or Psychic---however, with practice, anyone can learn to use divination. Inductive Divination relies on the individual to observe and interpret various signs and omens. 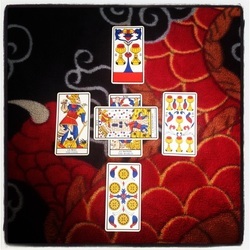 The modes of use in inductive divination are caused by chance and therefore cannot be affected by human behavior, which is believed to increase the validity of the information given. Form of inductive divination include, but are not limited to, Astrology, Palmistry, The Shape of Clouds, The Flight of Birds, The Movement of Wind, etc.. The information gained through divination is believed to come directly from God or the worker's spiritual ally or allies; and it is through divination that a spiritual worker determines whether a spell or working is justified or not. In addition, divination can and in many cases will reveal the best course of magical remediation for an individual's situation. Whether you are a professional reader, or casually read for family and friends it would be a good idea to establish for yourself the rules, or guidelines, regarding reading for others to which you adhere. Whatever information comes to me during a reading I feel obligated to share. I do not judge others for their lifestyle, mistakes, or decisions. However I will encourage clients to take responsibility for their thoughts, words, and deeds and advise them on improving their situation. I do not discuss things revealed during readings with anyone who wasn't present at that reading. I do not perform readings for couples in front of both parties. I will not necessarily turn someone away if they cannot afford to pay me, but I will make sure that I am not taken advantage of. No matter the outcome of the reading, I stress that the future CAN be changed and I always try to put a positive spin on my readings. Clients are like campsites, you always want to leave them in better condition than you found them!